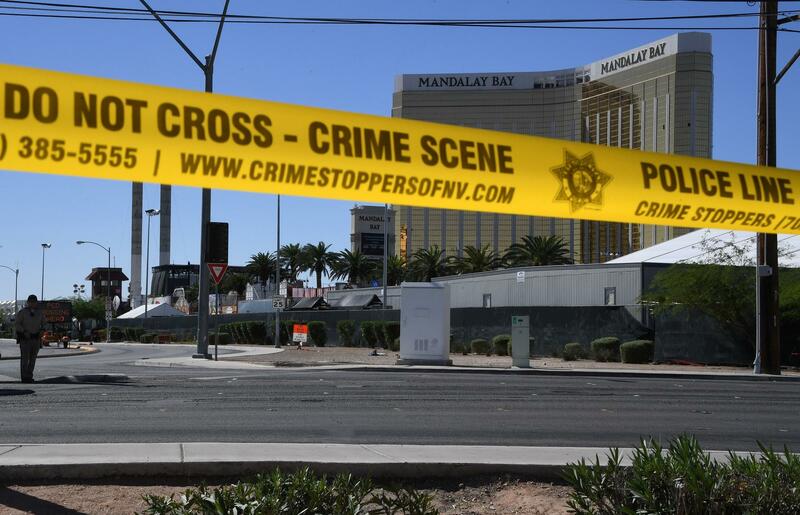 After a gunman fired from windows in the Mandalay Bay Resort and Casino at the Route 91 Harvest music festival in Las Vegas, guitarist Caleb Keeter, who was on stage Sunday, is calling for gun control — "RIGHT. NOW." The deadliest mass shooting in recent U.S. history has renewed conversations about America's gun laws, after one man strafed a country music festival from a high-rise hotel in Las Vegas on Sunday. The attack prompted a musician who played at the festival to say he's changed his mind — and that the U.S. needs new gun control. "I've been a proponent of the 2nd Amendment my whole life," guitarist Caleb Keeter said in a tweeted statement on Monday. "Until the events of last night. I cannot express how wrong I was." Keeter said that one man — who police identified as Stephen Craig Paddock — "laid waste to a city with dedicated, fearless police officers desperately trying to help, because of access to an insane amount of fire power." He added, "Enough is enough" before adding later, "We need gun control RIGHT. NOW." Keeter is a guitarist for the Josh Abbott Band. Hours before Jason Aldean's show was shattered by gunfire and bullets rained on a crowd of some 22,000 people, Keeter had played on the same stage. He and his bandmates and crew members were trapped by the violence, and Keeter says he wasn't sure if he would survive. His response is one of many in the country music community after Sunday's attack; it seems to be the first to announce a shift in thinking about gun control. Some of the band's crew members suffered shrapnel wounds, Keeter said, because of the power of the weapons being used. They had been standing close to someone who was shot. And despite having their own weapons, they were unable to defend themselves. "We actually have members of our crew with CHL [concealed handgun license] licenses, and legal firearms on the bus," Keeter said. "They were useless. We couldn't touch them for fear the police might think that we were part of the massacre and shoot us." He described writing to his loved ones and creating a living will, as performers, fans, and staff tried to find safety during the prolonged assault. Sunday night's attack left 527 people injured and 59 people dead. Police say Stephen Paddock brought a small arsenal to the Mandalay Bay Resort and Casino so he could carry out an attack on thousands of people. "We have recovered 23 firearms at Mandalay Bay, and 19 firearms at his home in Mesquite," Las Vegas Assistant Sheriff Todd Fasulo said. Paddock is known to have bought some of his firearms at the Guns and Guitars store near where he lived in Mesquite, Nevada. The store has said via a statement, "All necessary background checks and procedures were followed" in Paddock's purchases. It's one of several gun shops or firing ranges that have acknowledged having contact with investigators about Paddock, NBC News reports. Keeter's message found a large audience. It was liked more than 100,000 times and retweeted more than 50,000 times. The message sparked a number of replies, from people asking why other tragedies — such as the Sandy Hook elementary school shooting in 2012 — hadn't changed Keeter's views. Some responses accused him of lacking empathy and changing his stance only because he was personally affected. Others chastised those reactions, and for criticizing someone who now agrees with them. "It's frustrating that some don't call the fire dept until the blaze is at their own front door," a Twitter user named Heather Maravola wrote. "But we need more ppl on our side. Welcome." In response, Keeter wrote, "You are all absolutely correct. I saw this happening for years and did nothing. But I'd like to do what I can now." In speaking out, Keeter also raised the hopes of a Twitter user who said they hope the issue can move from a left vs. right dynamic "to actually enacting common sense gun laws." Opinion polls have shown large majorities of Americans agree on making several changes to gun control laws, from restricting people with mental illnesses from buying guns to requiring background checks for private gun sales and at gun shows. "Congress has not made a concerted effort to pass gun legislation since 2013," NPR's Susan Davis reports, "when the Senate tried and failed to overcome GOP opposition to expand background checks for gun purchases." Susan adds that so far in 2017, Republicans' action on guns "has focused on expanding gun rights" — including making it easier to buy silencers and to nationalize concealed-carry laws. And then there are the financial angles. After Sunday's shooting, the stock prices of large gun makers rose sharply. As Marketplace reported, on Monday morning the "value of Sturm Ruger shares went up by as much as 7.7 percent and shares of American Outdoor Brands Corp, manufacturer of Smith & Wesson firearms, went up by as much as 6 percent." "Largely in response to concerns there may be new tightening of regulations on buying the guns, or on gun ownership. And that has actually driven a lot of the buying that actually has given these guys a lift over the past eight years."